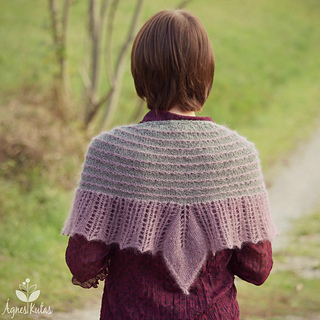 Once upon a time, there was a princess with magical needles, who loved to knit. She made the most beautiful shawls and people from all over the kingdom came to gaze upon them. One day, an evil witch visited her palace and became overcome with jealousy, seeing all that beauty, that she cast a horrible spell upon the princess’ needles. From this day on, the princess couldn’t finish any of her projects. 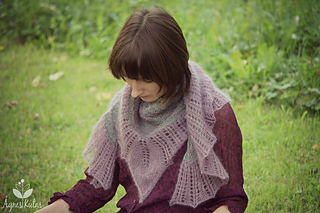 She knitted all day, uninspired, only to then frog her knitting in the evening because she didn’t like what she had finished. People started to call her the Frog Princess and told her story all over the kingdom, until one day, it was heard by an old lady in a far-off village. 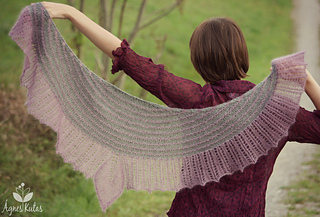 She knew she had to help and sent the princess a magical shawl pattern. 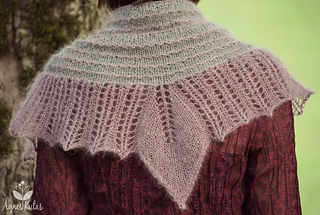 The princess knitted and knitted for three days and three nights and as the shawl blocked out, the spell was broken on her needles and she knitted happily ever after. 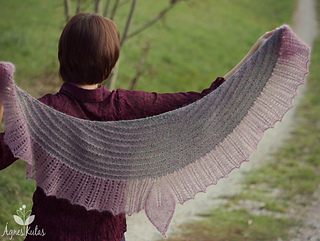 Frog Princess is a top-down crescent shawl. Charted and written instructions. US and metric measurements. 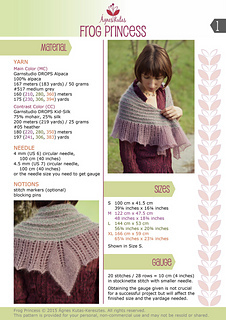 Shown in Size S. Note on sizing: shawl sizes have nothing to do with garment sizes! 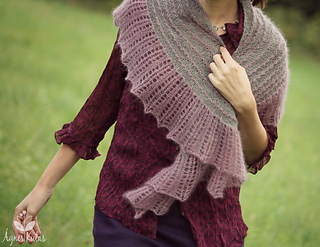 S is the smallest and XL is the largest size, choose your size according to how you want to wear the shawl, not according to the size of the sweater you wear. 20 stitches / 28 rows = 10 cm (4 inches) in stockinette stitch with smaller needle. Obtaining the gauge given is not crucial for a successful project but will affect the finished size and the yardage needed.